With small cities anchoring the north and south, the Kingdom is essentially a sprinkling of rural villages set among a sparsely populated landscape of farms and forests. 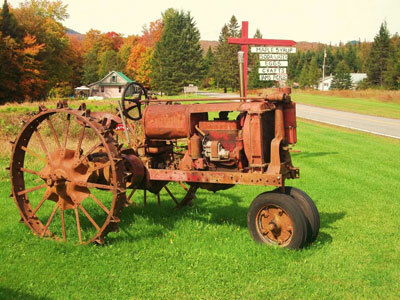 In Burke, village life still defines our communities and neighbors tend to run into one another regularly at general stores, post offices, restaurants, and churches as we share these village amenities that have sustained our needs for over 200 years. The town of Burke is comprised of three villages: East Burke, Burke Hollow, and West Burke. East Burke is home to Burke Mountain alpine and cross-country ski areas, as well as Burke Mountain Academy; the alma mater of a number of international ski champions. VAST snowmobile trails, which are used as hiking and biking trails during the bad sleddin' seasons, bisect the center of the village. This is the home and heart of Kingdom Trails, the world-class off-road bicycling trail network, which is open for cross-coutry skiing and snow-shoeing in the winter. The village and its environs boast a number of inns and B&Bs, plus a wide range of accommodations in rentals and condominiums on the mountainside. Among its many services, East Burke offers ATMs, groceries, gasoline, gifts, haircuts and styling, auto repair, and sporting goods and rentals, as well as several food and dining choices--from homemade take-out sandwiches and pizza, to pubgrub, to fine dining with a view. The beautifully restored Burke Mountain Clubhouse and Library, with its historic lawn and bandstand gazebo, provides a lovely centerpiece to the village with a view of an art gallery beyond the millpond. And that "noise" in the background is Dishmill Brook, rolling swiftly off Burke Mountain and through the village, where it joins the east branch of the Passumpsic River just above the old milldam. Burke Hollow rests in a beautiful glen dotted with homes and farms. There are no retail businesses, but the Burke Town School is located here. In the center of the Hollow is the old meeting house, frequently found in classic Vermont country photographs. Darling Hill, the ridge between Burke Hollow and East Burke, has a number of spectacular views from its maple-lined country lane, and is home to the Vermont Children's Theater and a couple of fine inns and restaurants. Burke Hollow Road, which connects East and West Burke through Burke Hollow, is a beautiful drive in any season, affording country scenes framed by Mt. Hor and Mt. Pisgah to the northwest and Burke Mountain to the southeast. Mind the road as you take this drive, though. Not only might you come across an occasional moose, but this stretch of road is also popular with bikers and off-season skiers on "roller skis." West Burke is the town seat and its old school house is home to the Burke Town Offices. The hub of several scenic roads, West Burke is the gateway to both Crystal Lake and Lake Willoughby, and is a popular stop on the snowmobile trail. The village provides B&B lodging and a variety of eating options, including an eclectic local cafe and pub that doubles as a gas station. Country markets also offer a variety of provisions in addition to groceries. Burke is surrounded by other Northeast Kingdom towns and villages, both large and small. To the south is Lyndonville, home of Lyndon State College, Wednesday night summer band concerts, and a variety of small town services. Farther south, St. Johnsbury with its population of nearly 10,000, is the nearest "big city" and home to a fine regional hospital, larger supermarkets, and the nearest movie theaters. North and northeast of Burke, some of the larger towns are; Barton on Crystal Lake; Newport, the Kingdom's other "small city" on the southern shore of Lake Memphremagog; Derby and Derby Line on the border with Quebec and Island Pond, just up the snowmobile trail (and State Route 114) from East Burke. Scattered all over and in between are dozens of wonderful small villages and crossroads, each with a distinct history, unique style, and something to discover--all just part of what makes living in and visiting the Burke area so special.